Take a peek at Arizona history. Discover an overview of Arizona's rich history, heritage, historic events, and culture. The "Grand Canyon State," Arizona, was the 48th state to join the U.S. in 1912-- the last of 48 contiguous (connected) states to join the Union. The state's name comes from arizonac, from two Papago Indian words meaning "place of the young spring." Arizona has a very dry climate and is known for its cactus plants. In fact, the state flower is the saguaro cactus blossom. Spanish exploration of the land north of Mexico focused on the three "Gs": God, Gold and Glory. According to Spanish legend, seven bishops fled Spain during the Moorish invasion and each founded a Christian city in a distant land. In 1527 the legend grew when a captured native told the Spanish of seven wondrous cities of great wealth. These cities were known as the Seven Cities of Cibola and were thought to be located north of what is now present day Mexico. In 1539 the viceroy of New Spain, Antonio de Mendoza, gave Franciscan missionary Fray Marcos de Niza orders to travel north in search of the legendary cities. From Yacapa, de Niza sent a Moroccan slave, Esteban, ahead to find the cities. His orders were to communicate with de Niza by sending a cross by messenger. The size of the cross would signify the importance of what he found - the larger the cross, the more important the discovery. Esteban sent de Niza very large crosses, but never saw him again. The friar learned from a surviving member of Esteban's party that they found the first of the Seven Cities of Cibola. De Niza was told that Esteban and his group were warned by a Zuni tribe not to enter the city. When Esteban insisted, he and most of his party were arrested and killed. When de Niza arrived at the site, he feared for his life and tried to bribe the native people with gifts. He was shown a hill overlooking the city that, he was told, was the smallest of the Seven Cities. Knowing the location, he was still afraid to enter, and returned to Mexico only to embellish his story with images of grandeur. Word of the discovery spread quickly. Francisco Vásquez de Coronado was then appointed to lead an expedition to bring back the riches of Cibola. The party eventually returned to Mexico to report they had found neither gold or silver nor the Straits of Anián. Coronado departed Compostela accompanied by Marcos de Niza, on February 23, 1540. His expedition included 336 Spaniards, 1,000 native Americans, 1,500 horses and mules, and countless slaves, cattle, and sheep. Marcos de Niza guided them along the San Pedro River valley, the same route he had earlier traveled. Coronado's group reached the city seen by Fray Marcos on July 7, 1540. Using an interpreter, Coronado tried to explain that he was there to defend the city's inhabitants for the Spanish king. The natives tried to kill the interpreter, which started the first battle between natives and Europeans in what is now the United States. Coronado was victorious and held a meeting with the defeated chief, learning he had captured a Zuni pueblo (town) named Hawikúh. He also learned there were five other pueblos nearby, not six, and none of them was filled with gold and silver. An angry Coronado sent Fray Marcos back to report the truth to the viceroy. The Zunis pointed Coronado to the west, hoping that he would leave in search of the gold and silver. He instead sent Captain Pedro de Tovar to explore the area. Tovar arrived at the Hopi villages of Tontonteac and Tusayán, only to be told by the Hopis that gold and silver were farther west. He sent word back to Coronado who then dispatched Captain García López de Cárdenas to further explore the area. Cárdenas traveled the same route as Tovar to the Hopi villages and then headed west, reaching the edge of what we now know as the Grand Canyon. Unimpressed with the canyon's natural beauty, but hoping to find gold and silver within, Cárdenas searched for an entrance to the canyon for three days. Having no luck, he returned to Coronado. During this same time, several hundred miles downstream from Cárdenas, Captain Hernando de Alarcón led the naval arm of Coronado's expedition on the Colorado River. When Alarcón reached the mouth of the Gila River, he learned about Coronado's discovery of the pueblos from the natives. Alarcón knew he could not provide naval help to Coronado. Before returning to Mexico, he buried informational letters under a tree and placed an identifiable inscription on the trunk. Captain Melchior Díaz, who traveled through the present day Sonora River valley, was under orders from Coronado to find Alarcón. Díaz explored west through land controlled by the Pima and Papago, a parallel route to the present day international border between Arizona and Mexico. Díaz reported this area was quite desolate and named it El Camino del Diablo (the Devil's Highway). The expedition traveled about 80 miles north of the Colorado River's mouth, near the area where San Luis, Arizona, is currently located. There the natives led Díaz to the tree where Alarcón's letters were buried. With the search for Alarcón's expedition resolved, Díaz and his men crossed the Colorado into what is now California. There Díaz accidently impaled himself on his own lance and died. His men sent a report to Coronado and traveled to Culiacán. Before the report could be delivered to Coronado, his expedition journeyed to the Rio Grande River valley. In New Mexico the natives described to him a place called Grand Quivira where even the lowliest peasant ate from golden plates. In search of Grand Quivira, Coronado and his men crossed what is now the Texas and Oklahoma panhandles, into Kansas. There they found a village with huts made of mud and straw, but no gold or silver. When Coronado questioned him, his native guide admitted to lying to him at the request of the Pueblo natives. Coronado, angry, ordered the guide killed and, using compasses, he and his men found their way back to the New Mexico pueblo. The following spring, Coronado ordered his party home to Mexico City where he reported to the viceroy that he had found no wealth. Although he returned to his post as Governor of Nueva Galacia, the rigors of the expedition and its expense left Coronado in failing health and his fortune gone. Some of the expedition's investors accused Coronado of mismanagement, cruelty to the native peoples, and even of finding wealth and then hiding it for his own benefit. He was convicted, removed as Governor, and stripped of his titles. In 1546, a review board in Spain cleared him of all charges. He died shortly thereafter. Today, the Coronado National Monument and the Coronado National Forest commemorate his early exploration of Arizona. The event that created new interest in exploration of Arizona was Francis Drake's voyage around the world between 1578 and 1580. The Spaniards did not believe Drake had actually sailed around the Cape of Good Hope at the southern end of Africa, or that he had sailed through the Straits of Magellan. They were convinced Drake found a northwest passage around North America. The Spaniards decided to search north to find this legendary waterway which they named the Straits of Anián. Friar Agustín Rodríguez, two other Franciscan missionaries, nine soldiers, and 16 native Americans left on an expedition on June 5, 1581 to find the waterway. They followed the Conchos River to the Rio Grande near the present site of Presidio, Texas. From there they traveled north along the Rio Grande to the Indian territory. Only one of the missionaries returned to Mexico. Fearing the safety of the other missionaries, Antonio de Espejo, a wealthy miner, organized a rescue party at his own expense. Led by Fray Bernadino Beltrán, the search party departed on November 10, 1582. When they arrived in New Mexico, they learned the two missionaries had been killed. Espejo began his search for the Seven Cities of Cibola and Grand Quivira journeying east, but found regions not worth exploring. The party eventually returned to Mexico to report they had found neither gold or silver nor the Straits of Anián. Madrid later ordered the colonization of New Mexico as a way of bringing Christianity to the reported large numbers of native peoples. The decree included the requirement that any colonizing expedition must be paid for by the expedition leader. In return, the leader would be named Governor of the area colonized. In 1595 Juan de Oñate received the contract for such an expedition. He left on February 7, 1598, with 400 colonists, 83 carts of baggage, and 7,000 animals. A delegation of Franciscan missionaries accompanied them. Oñate took possession of the territory at a site close to Santa Fe. Six months later, he set out to find the Seven Cities of Cibola and Grand Quivira. Arriving at the same village in Kansas that Coronado had discovered years earlier, Oñate was just as disappointed as his predecessor in what he found. In 1604, Oñate headed west across Arizona and traveled down the Colorado River to its mouth. He never found the gold, silver, and gemstones in stories told by the natives along the way. Oñate was later charged with offenses similar to those brought against Coronado. He was tried and convicted but later pardoned by the King of Spain. Oñate is generally considered to be the founder of New Mexico. Missionaries from Oñate's colony later worked with the Hopis, bringing Christianity to the tribe; however, some of the older Hopi tribal members felt the missionaries were trying to eliminate Hopi beliefs and traditions. They joined in the New Mexico Pueblo Uprising in 1680, killing the missionaries, and driving the Spaniards out of New Mexico. The Spaniards ended up founding El Paso del Norte, the site of present-day Juarez, Mexico. In 1693, Colonel Diego de Vargas managed to make a peaceful visit to the Hopi tribe. Although tribal members swore allegiance to the King of Spain, they did not permit the Spanish to occupy their land. Future colonization of Arizona would come from the south, making Arizona a part of Mexico, rather than from the east which would have made Arizona part of New Mexico. One of the most famous missionaries in Arizona was a Jesuit, Father Eusebio Francisco Kino, who was appointed missionary to the Pimas in 1687. As a young man, Eusebio Kino had been offered a professorship at the University of Inglestadt but, before accepting the post, he became ill, almost losing his life. He prayed to Saint Francis Xavier, promising to join the Society of Jesus should his life be spared. Upon his recovery, he kept his promise and adopted his middle name, Francisco, to show his gratitude. When Kino finished seminary, he asked for an assignment in the Orient but was assigned to New Spain. On arriving in Mexico City in 1681, he learned he was to colonize Baja, California. Despite his best efforts, colonization there failed. He was then assigned an area in northern Sonora known as Pimería Alta, the upper land of the Pimas. In 1687, he established the mission Nuestra Señora de los Dolores. From there he worked his way north and west, reaching Arizona in 1691. After establishing the mission San Cayetano Tumacácori, he traveled north to establish the missions San Xavier del Bac and Guevavi. San Xavier del Bac is the only one of the three that is still a mission today. Guevavi no longer exists and Tumacácori is no longer used as a mission. In addition to establishing missions, Father Kino taught the native peoples different agricultural methods and brought horses, sheep, mules, and cattle into Arizona. His teachings formed the basis for ranching in the Santa Cruz and San Pedro river valleys. Father Kino was also an explorer and mapmaker. He made several trips as far as the Gila River and twice traveled to the Colorado River. Before his exploration to the Colorado River, Baja California was thought to be an island. When he reached the mouth of the Colorado in 1702, Father Kino found that Baja California was a peninsula rather than an island. His 1710 map unveiled this discovery and was the model for all area maps for the next 100 years. The maps that Father Kino drew of the area, while widely distributed in Europe, were never attributed to him. Father Kino traveled more than 75,000 miles in his lifetime. At age 55, he averaged 40 miles a day for 26 straight days. He died in 1711 at Magdelena, Sonora. The missions Father Kino founded were not permanently staffed until 1732. The only missionary to truly venture into Arizona after Kino's death was Father Jacobo Sedelmayr, who traveled as far as the Casa Grande ruins. In 1796, a Yaqui native discovered silver in Arizona. He took samples of the silver to a Sonoran merchant and soon many Spaniards, hearing of the discovery, traveled to the area in search of easy wealth. Captain Juan Bautista de Anza of Fronteras arrived soon after to collect taxes. There was some question whether to tax the silver at 20% because it was an ore, or at 95% because it was a treasure. Before authorities in Madrid could make a final determination that the silver should be taxed at the higher amount, the area was abandoned because all of the surface silver had been removed. Not only would it take a large investment to tunnel for silver beneath the earth, there was also fear of aggression from Apaches in the area. A book published in Barcelona in 1754 notes the king referred to this as Real de Arizonas. During this time, an undercurrent of tension smoldered between the missionaries and the natives. On November 21, 1751, the Pimas attacked and set fire to the mission at Tubatma, Sonora. The missionaries managed to put out the fire and fend off the attackers, who retreated to the Catalina Mountains north of Tucson. Shortly after Mexican Governor Parilla sent Captain José del Carpio to pursue the Pima leader Luís Oacpicagua. Carpio established headquarters at Tubac and sent word out that no harm would come to any Pimas who returned peacefully to their pueblos and swore allegiance to Spain. Oacpicagua arrived in Tubac and accepted the terms, restoring peace in Arizona. The Pima Uprising brought a halt to additional exploration to the north. To prevent additional uprisings, the viceroy ordered two presidios (military posts) to be built. One, located in Tubac, was built as a walled fort made of adobe. By 1757, the presidio and the small town that had grown around the presidio boasted more than 400 residents. This gave the Spanish a permanent settlement in Arizona, and it also reduced the Jesuit influence with the natives. Two events in the mid-1760s had a profound effect on Arizona history. The first, the transfer of the Louisiana Territory to the Spanish, lessened the threat of the French to the Spanish colonies. The second was the issuance of a decree by King Charles II of Spain to expel all Jesuits from the Spanish Empire. This latter event required that the Jesuits from the Arizona missions be taken into custody and sent to Mexico City. From there they were sent to Vera Cruz where they were put on ships bound for Europe. Their property, including the missions, reverted to the government. The missions in Pimería Alta were given to the Franciscans. By this time the missions were deteriorating, and most of the natives reverted to their original beliefs. Father Francisco Tomás Hermengildo Garcés, who arrived at San Xavier del Bac in 1768, rivals Father Kino as the most influential missionary in Arizona. He continued the explorations that Kino had started many years earlier. During one of his trips, he explored the region in what is now Calexico. There the natives told of Europeans to the west. Garcés noted that there were two gaps in the mountains to the west and believed an overland route to California was possible. He reasoned an overland route would make it easier to deliver supplies to the missions, rather than bringing them by sea, which often proved treacherous. Garcés and Captain Juan Bautista de Anza together requested authority to explore the area. On authority granted by the viceroy, the two men and their party managed to reach the San Gabriel (Los Angeles) mission and the Monterey presidio. Garcés still thought there might be another overland passage farther north. They explored this route and discovered the Great Salt Lake. After their supplies dwindled, they were forced to return to New Mexico. In 1781, the Spanish established two settlements along the route taken by Garcés and Anza, beginning with Yuma Crossing. There missionaries assigned some lands previously held by the Yumans to soldiers to farm. In addition, when the Spanish disciplined the natives, yet allowed the colonists and soldiers to take what they wanted from them, the natives became angered. On July 17, the Yumans attacked the settlements, clubbing the soldiers to death, killing the male colonists, and taking women and children as slaves. They spared Garcés and another priest for two days before killing them. Although the women and children were ransomed to Captain Pedro Fages two months later, the hostility of the Yumans prevented any connection between California and Arizona for more than 50 years. The Royal Regulations of 1772, decreed by King Charles III of Spain specified many changes to be made in New Spain. Among them was moving the presidio at Tubac to Tucson which became the Presidio San Agustín del Tucson in 1776. With native hostility still high, the viceroy of New Spain, Bernardo Gálvez, issued Instructions for the Governing of the Interior Provinces of New Spain in 1785. Included was a specification that natives requesting peace be placed in villages close to the presidios and given presents of inferior firearms and alcoholic beverages. To the dismay of the Franciscans, Gálvez's plan was not to Christianize the natives, but to corrupt them. In spite of many problems and complaints, the Gálvez plan did bring peace to Arizona. When peace arrived, so did the settlers, ranchers, farmers, and miners. Notable land grants of the period include the Canoa and the Sonoita land grants. Arizona's peace was not even disturbed by the Mexican War of Independence. Spain recognized Mexico's independence in the Treaty of Cordoba, August 24, 1821. In the new Republic of Mexico, the area we know as Arizona became part of El Estado Libre de Occidente (the Free State of the West), which also included Sonora and Sinaloa. The Mexican flag was raised at Tucson, the only major settlement in Arizona. In 1831, differences between Sinaloa and Sonora caused the two states to separate. 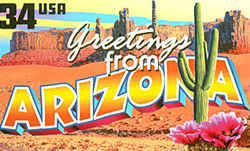 Arizona remained part of Sonora until it became part of the United States. The first significant American exploration of Arizona occurred after a trade route was established between St. Louis and Santa Fe. From Santa Fe, fur trappers trekked across northern Arizona. The most famous trapper was Bill Williams for whom the town of Williams, Bill Williams Mountain, and the Bill Williams River are named. The first American to write about Arizona was Ohioan James Pattie. The Apaches again instigated war in 1831. Mexico tried to quell the hostilities by reinstituting the Royal Regulations of 1772, but the plan was outdated. Because the Sonorans had neither strong leadership nor soldiers well equipped and knowledgeable about their arms, the population of Sonora declined from the mid-1830s but increased in other parts of Mexico. Arizona did not play a role in the Mexican-American War. Most of the battles were waged in Texas, New Mexico, and California. Because Arizona had no major cities and no mines, it was of no real value to either side. The Treaty of Guadalupe Hidalgo, signed on February 2, 1848, ended the Mexican-American War and called for Mexico to cede a portion of its land to the United States in exchange for $15 million. The ceded portion included all of present-day Arizona north of the Gila River. The treaty was ratified July 4, 1848, but establishing the boundary between Mexico and the United States proved to be a difficult task. The United States placed Lieutenant Amiel Weeks Whipple in charge of the Boundary Commission. The commission delineated a boundary between upper and lower California. A joint commission consisting of officials from both countries was to complete the remainder of the work that was considered part of the treaty, although not originally specified in it. President James K. Polk appointed John B. Weller as Boundary Commissioner. Later, President Zachary Taylor appointed John Charles Fremont to the post. Fremont accepted the position but resigned before he took office as he had been elected US Senator from California. Weller then continued to serve until he was fired in 1850. William H. Emory, the next Boundary Commissioner, managed to finish marking the California and Mexico boundary before resigning. The next commissioner, John Russell Bartlett and Mexican Commissioner General Pedro García, discovered a problem. The treaty had specified that the southern boundary of New Mexico was to follow an 1847 map published by J. Disturnell. That map showed El Paso (currently Juarez, Mexico) to be 34 miles north and 100 miles east of where it actually is. An agreement was reached but would not be valid without the name of the surveyor. As the surveyor had not yet arrived in El Paso del Norte, Whipple was appointed interim surveyor and approved the agreement. When surveyor Gray arrived he declared the agreement invalid. By the summer of 1852, sentiment was growing against Commissioner Bartlett, who had been charged with private use of government transportation, mismanagement of public funds, general negligence, and disregard for the health, comfort, and safety of those under his charge. Added to this was the Bartlett-Conde Agreement that gave 6,000 square miles of territory to Mexico--land that the US considered necessary for a transcontinental railroad. President Millard Fillmore was forced to halt work on the survey after Congress attached several amendments to appropriations bills deleting funds for the survey's completion. In the meantime, both New Mexico and Chihuahua believed the 6,000 square miles belonged to their states respectively. It appeared as if a second Mexican-American War was imminent. When Franklin Pierce became president of the United States, he reasoned that the Mexican dictator, Antonio López de Santa Anna, needed money, not a war. In March 1853, President Pierce appointed James Gadsden as his emissary to Mexico to settle the dispute. On December 30, 1853, the Gadsden Purchase agreement was signed. By 1855, the land between the two countries had been marked and all of Arizona, with the boundaries we know today, became part of the American territory. Many people who traveled through Arizona after the Mexican-American War were on their way to the California gold fields. The military began arriving in Arizona and in 1849 Camp Calhoun was established. A year later its name was changed to Camp Independence, and in 1851 it was abandoned as a military camp. The camp was once again occupied in 1852 and named Fort Yuma. Other military forts established in Arizona before the Civil War included Fort Defiance in 1852, Fort Buchanan in 1856, Fort Mohave in 1859, Fort Aravaipa (later to be called Fort Breckenridge) in 1860, and Camp Tucson in 1860. All of these forts were governed by either California or New Mexico because Arizona was not yet a separate territory. To travel between the few scattered towns and the military forts, roads were needed. In 1851, Captain Lorenzo Sitgreaves established a route across Arizona at approximately the 35th parallel near which the towns of Williams, Flagstaff, and Kingman grew. Early settlers included Dr. Able Lincoln, who owned and operated the Colorado River ferry in Yuma. L.J.F. Jaeger took over operations when Dr. Lincoln was killed by Yumans. Pete Kitchen established a ranch in southern Arizona on which he raised pigs and cattle and grew grain, potatoes, cabbage, and fruit. Unfortunately, Kitchen built his ranch on an Apache war trail. The Apaches were intrigued by the pigs, which they had never before seen. They liked shooting the pigs full of arrows so that, in the words of Kitchen, they looked like "perambulating pincushions." Sylvester Mowry, a military officer, promoted mining in Arizona before the Civil War. When he heard that a meeting was to be held in Tucson to discuss Arizona becoming a separate territory, he saw a chance to escape the military life at Fort Yuma. With the settlers who came to the new land to ranch also came some in search of gold and silver. One such individual, Charles Poston, thought silver could be mined in the Tucson area. He discussed this possibility with Major Samuel P. Heintzelman, the commanding officer at Yuma. Poston then left for Heintzelman's home town in Cincinnati, Ohio to obtain funding for the Sonora Exploration and Mining Company which developed several mines in the Tubac area. Among them the Heintzelman mine proved to be the richest. The first meeting to discuss Arizona becoming a separate territory occurred in 1856. The dividing line between Arizona and New Mexico was proposed as an east-west line drawn at approximately the 34th parallel. The second meeting, the one about which Mowry heard, resulted in a petition bearing 260 signatures, among them the names of early Arizona pioneers: Mark Aldrich, Herman Ehrenberg, Edward E. Dunbar, Peter R. Brady, Frederick Ronstadt, Granville Oury, and Charles Schuchard. Mowry decided to present the idea of a separate Arizona territory to Congress himself. While in Washington, Mowry wrote Memoir on the Proposed Territory of Arizona, the first published work devoted entirely to Arizona. There he also established the Arizona Land and Mining Company and purchased the Sopori Grant, a 220 acre land grant. He resigned his military commission in 1858 and became Arizona's territorial delegate. In April 1860, when asked again to serve as territorial delegate, he declined, citing the ten bills attempting to create the Arizona territory that had failed to pass. Instead he acquired the Patagonia Mine, changed its name to the Mowry Mine, and began mining silver. In February 1860 the New Mexico legislature passed a bill creating an Arizona county with Tucson as its county seat. Despite this, the county was never formed. The people of southern Arizona and southern New Mexico decided to create a separate territory for themselves. They even drew up a constitution that they decided would be valid until Congress acted. That constitution was published, becoming the first book published in Arizona. Arizona was even part of the Confederacy for a time. In 1860, residents living in the Gadsden Strip proclaimed that area as a separate territory. A similar statement was made a week later by Tucson residents. When word reached Tucson in May about the Southern victory at Fort Sumter, residents erected a flagpole, raised the Confederate flag, and played "Dixie's Land." A bill introduced by John H. Reagan of Texas on November 22, 1861, called for recognition of Arizona as a Confederate territory. President Jefferson Davis signed the bill on February 14, 1862, exactly 50 years to the day before Arizona would become a state. The western most battle of the Civil War was fought at Picacho Pass northwest of Tucson on February 15, 1862. The Confederates won the battle, but the win meant nothing. Finally, on February 24, 1863, after several bills had been introduced and then failed, President Abraham Lincoln signed into law the bill that provided for the Territory of Arizona, with a boundary separating it from New Mexico at approximately 109° longitude. The first officers of the Territory, appointed by President Lincoln on March 4, 1863, were the following: Governor John A. Gurley; Chief Justice John Noble Goodwin; Secretary Richard C. McCormick; Associate Justices William T. Howell and Joseph P. Allyn; District Attorney Almon Gage; US Marshal Milton B. Duffield; and Superintendent of Indian Affairs Charles Poston. Unfortunately, Gurley died before leaving Washington. In his place, Goodwin was named Governor and William F. Turner was appointed Chief Justice, replacing Goodwin. The first capitol was near the mines in the Chino Valley. The town was originally called Goodwin in the Governor's honor. Then the name Granite was suggested because the town was located along Granite Creek. Secretary McCormick then suggested the name Prescott, after the historian who wrote History of the Conquest of Mexico and who had noted in that work the nearness of Arizona to Mexico. The name "Prescott" was chosen. The 1st Territorial Legislature convened in Prescott in September 1863 and established the Howell Code, a code of laws compiled by Associate Justice William T. Howell. The Legislature also approved four counties, appointed a Board of Regents for a proposed university, and appropriated funds for public education. During the Civil War and the early days of the Arizona Territory, war was being waged against the native people. By April 1864, Kit Carson and his men had captured more than 8,000 Navajos and moved them to Bosque Redondo, a reservation in eastern New Mexico. Many Navajos died there because the climate was so different from northeastern Arizona. In June 1868, the government moved the Navajos back to a reservation that spanned northeastern Arizona and northwestern New Mexico. 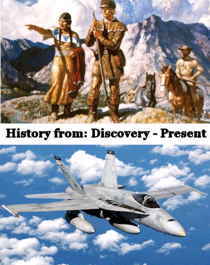 At the time that Carson was fighting the Navajo Nation, others were trying to fight the Apaches with mixed success. When Richard McCormick became Governor in 1866, one of his first acts was to move the capitol from Prescott to Tucson. When McCormick later became territorial delegate to Congress, President Ulysses S. Grant appointed Anson Peaceley-Killen Safford as Governor. Safford advocated free public education. The Legislature responded by establishing a public school system, and Safford become known as the "Father of Arizona Schools." President Rutherford B. Hayes appointed John Philo Hoyt Governor in 1877, the same year the capitol was moved back to Prescott. A year later Hoyt was asked to resign in favor of John Charles Fremont. Fremont resigned two years later after many people protested his absences from the Territory. President Grover Cleveland asked for Tritle's resignation so that he could appoint Conrad Meyer Zulick, who had to be rescued from a Mexican jail before he could take office. Zulick moved the capitol to Phoenix and was criticized for his position that the native people should be treated as humans. Zulick resigned when a Republican administration took over the presidency in 1889. Next to serve was Lewis Wolfley, but President Benjamin Harrison later removed him from office and appointed John Nichol Irwin as Governor in 1896. Irwin faced a growing demand from the people for statehood. The state's legislature authorized a constitutional convention in 1891, even though Congress had not passed enabling legislation. The voters, in December 1891, passed the constitution created by delegates that included 17 Democrats and five Republicans. Congress found several flaws in that constitution, among them the establishment of silver as the legal currency instead of gold as the standard. Legislation introduced in Congress by Arizona's territorial delegate, Marcus A. Smith, failed in the Senate as Republican legislators feared letting a Democratic state into the Union. Other Governors before statehood included Nathan Oakes Murphy (twice), Louis C. Hughes, Benjamin Joseph Franklin, Myron Hawley McCord, Alexander O. Brodie, Judge Joseph H. Kibbey, and Judge Richard Elihu Sloan. In 1898 the United States declared war on Spain. Because they believed that serving in the war would help strengthen their bid for statehood, many Arizonans signed up. Captain Buckey O'Neill, one of Theodore Roosevelt's Rough Riders, was among the many who were willing to risk their lives so that a star, representing Arizona, could be added to the US flag. Arizona before and at the turn of the century was still a wild place. Violence was a way of life in this corner of the Old West. Shootings were commonplace, and robberies of trains and stagecoaches occurred fairly regularly. The most famous gunfight occurred in Tombstone on October 26, 1881, pitting the Earp brothers and Doc Holliday against the Clanton gang. "The Gunfight at the OK Corral" actually lasted only about 15 seconds and was most probably fought in an alley, not at the OK Corral. The last stagecoach robbery actually occurred in Arizona in 1899. Joe Boot and his accomplice, Pearl Hart (known as the "Girl Bandit"), were brought to trial in 1900. Joe was convicted, but the all-male jury found Pearl innocent. The decision angered the judge, and he ordered her to stand trial on a new charge. She was found guilty in that trial and sentenced to prison at the Yuma Territorial Prison. She was released early due to a faked pregnancy. In 1901 Governor Murphy authorized the formation of the Arizona Rangers. Until 1909 when the group was disbanded, the Rangers helped track down and arrest cattle rustlers and worked to suppress striking miners. In 1909, the legislature voted not to continue the Arizona Rangers because those counties not disturbed by the outlaws or striking miners did not want to pay for services they did not need. On New Year's Day 1909, an event occurred that had great significance to Arizona and the United States, although it was not recognized as a momentous occasion at the time. On that date, Barry Morris Goldwater was born to Baron and Josephine Goldwater. Also in 1909, the famous Chiricahua Apache leader Geronimo died at age 80. In 1910 two brothers, Ernie and Oscar Woodson, boarded a train in Phoenix. Before the train reached the town of Maricopa, the two brothers stopped the train, robbed the passengers of money and valuables, and rode away on the horses they had hidden previously. Maricopa County Sheriff Carl Hayden formed a posse and loaded the posse members and their horses on a special train bound for the robbery site. There Pima natives easily picked up the brothers' trail. Sheriff Hayden headed on to Maricopa where he located an automobile to pursue the brothers while the posse followed on horseback. This was the first time an automobile was used to chase criminals in Arizona. Sheriff Hayden and the posse found the brothers, both of whom eventually surrendered. Because the sheriff had developed a reputation of being a steady, cool-headed lawman, the citizens of Arizona elected him their first US Representative in Congress when Arizona became a state. 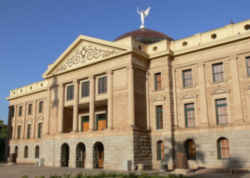 In 1910 Congress passed the enabling legislation for a constitutional convention for Arizona. Election Day, September 12, 1910, saw 41 Democrats elected delegates to the convention out of a total of 52 delegates. The constitution created by these delegates included a bicameral legislature with legislators of both houses being elected every two years, a two-year term and low pay for the Governor, and the popular election of judges. It also specified that all officials, including judges, were subject to recall. The voters overwhelmingly approved the new constitution on February 9, 1911. The following August, Congress passed a joint resolution calling for statehood for both Arizona and New Mexico, however, President William Howard Taft vetoed the measure because he strongly opposed the recall of judges. He refused to allow admission of Arizona as a state until that provision was stricken from its constitution. Within a week Congress passed another joint resolution excluding judges from recall. On December 12, 1911, voters in Arizona exempted judges from recall and elected a slate of officials, including George W.P. Hunt as Governor; Sidney P. Osborn as Secretary of State; Marcus A. Smith and Henry F. Ashurst as US Senators; and Carl Hayden as the US Representative. On February 14, 1912, President Taft signed the proclamation making Arizona the 48th state. The signing ceremony was recorded by movie cameras for the first time. Shortly after officially becoming a state, the voters of Arizona showed their independence by amending their constitution to once again make judges subject to recall. Arizonans celebrated their new statehood in various ways. A statehood tree was planted in Prescott's Courthouse plaza. The University of Arizona dismissed its students, all 254 of them, from classes. Governor-elect George Hunt walked from the Ford Hotel to the Capitol. William Jennings Bryan spoke for two hours at the statehood ceremonies at the Capitol. A 48-gun salute had to be halted after 38 shots because the booming rattled the windows and panicked the horses. In Bisbee, miners set off dynamite; in Snowflake, residents blew up an anvil. And in Phoenix, people took to the street and some fired their pistols into the air. One couple, Joe Melczer and Hazel Goldberg delayed their wedding, scheduled for earlier that morning, until they got the word that Arizona had become a state. They thus became the first couple married in the state of Arizona and exchanged rings presented by three-year-old Barry Goldwater. Newspapers reported that, in spite of all the celebrations, very few people spent the night in jail. George W. P. Hunt, a Democrat, became the Arizona's first Governor, serving a total of seven terms, though not in succession. Hunt lost his bid for re-election to his third term on November 7, 1916. Thomas Campbell was declared the winner by 30 votes; however, both men took the oath of office as Governor of Arizona on December 30, 1916. As the new year began, Governor Hunt refused to vacate the Governor's office and Campbell opened a temporary office in his home. On January 3, the state treasurer and the state auditor both stated they would not honor checks signed by Campbell. On January 23, Phoenix hotels and lodging houses agreed to give credit to members of the legislature until a Governor was authorized to pay them their fees. The fight over who was Governor continued when Governor Hunt took his case into Arizona's Superior Court in Phoenix on January 25, 1917. The next day postal authorities decided that all official mail for the Governor would be delivered to Sidney P. Osborn, the Secretary of State, until the Superior Court made its ruling. On January 27, the court declared Thomas E. Campbell Governor, de facto, of Arizona. Two days later Hunt agreed to turn his office over to Campbell. On December 22, 1917, the Supreme Court reversed the Superior Court's decision and declared that Hunt was legally elected Governor. Campbell, who had served as Governor 11 months and three weeks turned his office over to Governor Hunt three days after the court's decision was handed down. On January 8, 1918, Campbell filed an unsuccessful appeal to the Arizona Supreme Court for a rehearing of the gubernatorial contest. Campbell was elected Governor in November 1918. Former Governor Hunt departed the state for Bangkok on June 16, 1919, to serve as US Minister to Siam. He eventually returned to be elected to another term as Governor. John C. Phillips, a Republican lawyer, defeated George Hunt in the 1928 election. His accomplishments include the following: establishing the Bureau of Criminal Identification; establishing free county libraries; and creating the Colorado River Commission. Like most Republicans in 1930, during the Great Depression, Phillips lost the election to his opponent, George Hunt. Dr. Benjamin Baker defeated Governor Hunt in the primary election in 1932 in what would be the last time Hunt was a candidate for office. On December 25, 1934, George W.P. Hunt died at his Phoenix home at the age of 75. His body lay in state in the Capitol rotunda on the Great Seal of the State of Arizona that he helped design. Dr. B.B. Moeur went on to win the general election in 1932. Governor Moeur was a physician who had practiced in Tombstone, Bisbee, and Tempe. Many people joked that the babies Governor Moeur had delivered over the years were now the adults who elected him Governor. Moeur won re-election in 1934. During his four years in office, he dealt with the Depression by cutting property taxes by 40% and establishing new taxes, including those on sales and income. He was defeated in the primary election in 1936, mainly due to the continuing economic problems of the time. Rawghlie Clement Stanford, another Democrat, was elected Governor in 1936. Before being admitted to the bar, Stanford had been a cowboy and a soldier. During his single two-year term, the federal Social Security Act was instituted in Arizona, unfair sales practices were outlawed, and minimum wage laws were established. Robert Taylor Jones succeeded Governor Stanford. Jones was an engineer who worked on the railroad, helped construct the Panama Canal, and worked at a mine in Nevada. Although Jones came to Arizona to work on the railroad he ended up opening a drug store in Superior. That store led to a chain of drug stores that made him well-known around Arizona. His name recognition helped elect him to the State Senate three times before being elected Governor. While Governor, his friendship with several state senators did not sit well with members of the House of Representatives. In spite of that, laws passed during his administration included minimum wages for public works employees and establishment of the Department of Library and Archives. He chose not to seek re-election. Sidney Preston Osborn succeeded Governor Jones. Osborn was a native Arizonan and had served three terms as Secretary of State. He had also served as the youngest, at age 24, elected member of the Constitutional Convention. After his service as Secretary of State, he involved himself in journalism and publishing. In 1940 he was elected Governor and was re-elected three times, thus becoming the first Governor to serve four consecutive terms. During his tenure, World War II and its post-war boom occurred. The War brought military installations to Arizona; the post-war boom saw the population double, bringing social and educational problems as well as the reality of a shortage of water. Governor Osborn died in office on May 25, 1948, of amyotrophic lateral sclerosis (ALS). Democrat Dan Garvey succeeded Osborn. Garvey had been Secretary of State when Governor Osborn died and thus became acting Governor. In the elections of November 1948, the voters passed a constitutional amendment establishing the line of succession for political officers. Garvey was then sworn in as Governor, rather than acting Governor, and was elected in his own right in that election. Garvey served one full term and then was defeated in the primary election of 1950. Arizona Democrats nominated a woman for Governor in 1950. Ana Frohmiller had been the state auditor and was highly regarded. The Republicans chose to nominate Howard Pyle, a radio personality known as the "Voice of Arizona." Pyle narrowly won that election and then was re-elected in 1952 by a wide margin. He was defeated in 1954, largely due to an incident at Short Creek, Arizona. In 1909 the town of Millennial City was established on the Utah-Arizona border. The town's founding fathers were polygamists who considered themselves "unreconstructed." Soon the town was renamed Short Creek, for a nearby creek that did not run very far. In the 1890s, the Mormon Church declared polygamy illegal so that Utah could be considered for statehood. Many of the church elders who did not want to give up the practice of polygamy moved to Short Creek. Two stories arose about the houses in Short Creek. One was that the houses were so constructed that the bedroom was in Arizona while the living room was in Utah; the other was that the houses were built on skids to enable the houses to be dragged across the border from the state that was giving the polygamists trouble. Some people claimed that young girls were being forced into polygamist marriages against their will. Officials in Mohave County protested the number of welfare claims from young women all identifying the same husband. The town fathers essentially told all outsiders to mind their own business. In 1953, the Arizona Highway Patrol, under Governor Pyle, staged a surprise summer raid on Short Creek, taking the polygamists to Kingman and the women and children to Phoenix where the latter were placed in foster homes. The children's rural customs and outmoded dress made them rather conspicuous. Within several months, Short Creek's citizens were allowed to return home when the state's case against them was dismissed. In 1958, the citizens changed the name of the town to Colorado City. The Mormons, who strongly disliked the actions taken in Short Creek, banded together to defeat Governor Pyle in 1954, electing instead Ernest McFarland. McFarland had served in the US Senate from 1940 to 1952 when he was defeated by Barry Goldwater. McFarland served two terms as Governor, choosing in 1958 to run again for the US Senate but he was unsuccessful in his attempt. Paul J. Fannin, a Republican, was elected Governor in 1958 and served three terms. During his tenure, he argued Arizona should receive a greater portion of Colorado River water. Fannin was elected to the US Senate in 1964 when Barry Goldwater chose to run for US President. Samuel P. Goddard, Jr., a Democrat, won the Governor's seat in 1964. Goddard had run unsuccessfully in 1962 and would do so again in 1966 and 1968. John Richard "Jack" Williams succeeded Governor Goddard. Williams, a Republican, was another radio personality who had also served as the mayor of Phoenix. In 1965, the courts ordered redistricting under the "one man-one vote" requirements dictated by the US Supreme Court. When Governor Williams was elected in 1966, the people also elected a predominantly Republican Senate and House, making the legislature and Governor's office Republican for the first time in the state's history. Williams was re-elected in 1968 and again in 1970, becoming in the latter year the first Governor to serve a four-year term due to a constitutional change. One of the major projects initiated during Williams' tenure was the Central Arizona Project. In 1974, Raul Castro was elected Governor, the first Hispanic to hold that office in Arizona. Castro was a former judge. He left office on October 20, 1977, before the end of his gubernatorial term, to accept an ambassadorship to Argentina under President Jimmy Carter. Castro's successor was Secretary of State, Wesley Bolin. Bolin, who served as Secretary of State for almost 29 years before becoming Governor, died in office less than five months after becoming the state's chief executive. The succession in office established by the voters in the 1948 election provided that the Secretary of State becomes the new Governor; however, in order to assume the office of Governor, the Secretary of State must have first been elected to the office. When Wes Bolin became Governor, he appointed his long-time assistant Rose Mofford as Secretary of State. Mofford had not yet been elected to the office at the time of Bolin's death. Therefore the next elected person in succession, Attorney General Bruce Babbitt, became Governor and was later elected and served two full terms. As Governor, Babbitt is most remembered for the 1980 implementation of a major groundwater management program. In 1981, the state legislature and Governor Babbitt approved the concept for the first statewide Medicaid managed care system based on prepaid, capitated arrangements with health plans. Known as the Arizona Health Care Cost Containment System (AHCCCS), the program was approved by the Health Care Financing Administration in 1982. Over the years this program has repeatedly received praise from independent evaluations for effectiveness. In 1985, Babbitt focused on the protection and education of the state's children. He championed strict penalties for child abusers and established an Office of the Child. Subsequently, Arizona child welfare programs received high marks. After he left office, he unsuccessfully ran for the US presidency in 1988. President Bill Clinton appointed him Secretary of the Interior in 1993. For more information about Babbitt's accomplishments see page 269. Arizona's next Governor was Evan Mecham, an automobile dealer. Mecham served one term in the state senate and ran for US Senate in 1962 against Carl Hayden. He unsuccessfully ran for governor in 1964, 1974, 1978, and 1982. In 1986 Mecham won the election carrying 40% of the vote. One of his first acts as Governor was to rescind an Executive Order that had established a holiday honoring Dr. Martin Luther King, Jr. Within a year after election, Mecham was facing impeachment, recall, and a criminal trial. He was impeached in April 1988, and Rose Mofford, who by that time had been elected Secretary of State several times, became Governor on April 5, 1988. Mofford was the first woman to serve as Arizona's Governor. In 1988, Arizonans passed a referendum requiring the constitutional officers to be elected by a majority of votes in elections. If no one received 50% plus one of the vote, a run-off election was to be held to select a winner from the top two candidates. Two years later this provision was invoked. Governor Mofford decided not to seek election in 1990. The Democrats nominated Terry Goddard who had been mayor of Phoenix for several years and who was the son of former Governor Sam Goddard. The Republicans nominated J. Fife Symington III, a Phoenix real estate developer. Neither candidate received 50%+1 of the vote. A run-off election was conducted on February 26, 1991. Symington won by more than 40,000 votes. Also in 1991, several legislators and others were caught in a scandal known as AzScam. A "sting" operation, which involved lobbying to bring legalized gambling to Arizona, resulted in some legislators being sent to prison and several others resigning. In 1994, Symington won re-election. On June 13, 1996, Symington was indicted on criminal charges, was convicted by a federal jury on Sept. 3, 1997, and resigned as governor. (His conviction was later overturned by the 9th US District Court of Appeals). Secretary of State Jane Hull became Governor and took the oath of office on September 8, 1997, administered by US Supreme Court Justice Sandra Day O'Connor. Governor Hull was elected to a full term as Governor in 1998. In that election, five women were elected to constitutional offices in Arizona: Governor Jane Dee Hull; Secretary of State Betsey Bayless; Attorney General Janet Napolitano, the lone Democrat among the "Fab Five"; State Treasurer Carol Springer; and Superintendent of Public Instruction Lisa Graham Keegan. Brenda Burns was also re-elected president of the Senate, continuing as the first woman to hold that post. Hull is the 20th Arizona Governor and is the first woman to be elected as Governor. She also holds the distinctions of being Arizona's first woman Speaker of the House of Representatives and the first Republican woman elected Secretary of State and Governor. Other interesting political facts: Arizona had only one representative in Congress for 28 years from 1912 until 1940, when it gained one additional seat. Arizona gained its third seat 20 years later as a result of the 1960 census. One additional seat was gained as a result of each census taken in 1970, 1980, and 1990 for a total of six. It is expected that the state will gain two more seats as results from the 2000 census are counted. In the section of this Blue Book on Arizonans in the Federal Government, you will find a listing of all the senators and representatives in Congress from Arizona since statehood.